Wiseman is an evil Sorcerer from Earth's future in the 30th century. 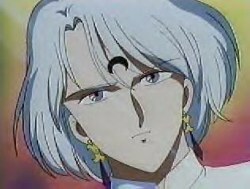 In order to conquer the Earth of his time, he sends the leaders of the Negamoon family back in the past. 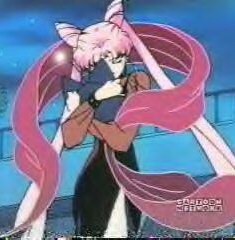 This past is Sailor Moon's present! The Negamoon family's mission is to destroy the future site of Crystal Tokyo. Wiseman also wants Rini to be captured along with the Silver Crystal. Rubeus is a member of the Negamoon family of the future As such, he is a servant of the Wiseman. His mission is to find a way to destroy the future site of Crystal Tokyo. He uses the Four sisters to handle all of his dirty work. He and the four sisters arrive at the same time as Rini. He fails in his mission. Catsy is the most aggressive of the four sisters. She is also the most vain. She is obsessed with her face. She has cat's ears in her hair and does very little "hand-to-hand" combat with the Scouts. She is the youngest of the four sisters. Her scout equal is Sailor Mars. Birdy is the 'thinker' of the four sisters. She uses complex plans instead of battles to achieve her goals. She fights less with her sisters, then they do with each other. She dresses very conservatively in public, but very differently at all other times!! Her scout equal is Sailor Mercury. Out of all the sisters, Avery cares least about taking over the Earth. She fights with Prisma a lot. She's very vain when is comes to her physical appearance. Her trademark weapon is the Whip. Her Scout equal is Sailor Venus. Emerald is sent to continue where Rubeus left off, after he failed. 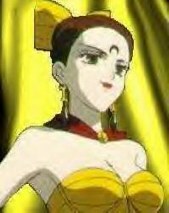 Her mission is to convert the crystal points of the Earth into Dark points by gathering vast amounts of Evil energy. 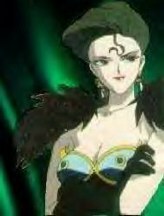 She wants to win the love of Prince Diamond who is to become the Ruler of the newly conquered Earth. Prince Diamond is the ruler of the Negamoon family. He believes that with the Wiseman's help he can destroy the people living on Earth and keep it for himself. His major weakness lies in Neo-Queen Serenity for he wishes to take her hand in marriage and have her rule the Negamoon by his side. Sapphire is Prince Diamond's brother. He assists him in trying to conquer the Earth. 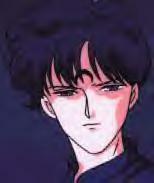 He overhears the Wiseman's plan to betray the Negamoon family and tries to warn Diamond. 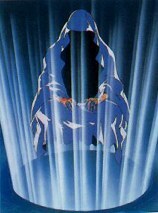 Before he has a chance to convince Diamond to stop the attack on Earth, the Wiseman strikes him down. When the Sailor Scouts go to the future, Rini is captured by Wiseman. He infused her with Dark Energy, causing her to grow and become evil. 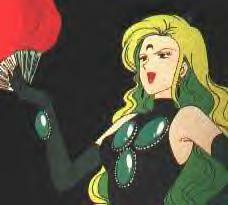 Wiseman used Wicked Lady to fight against her mother, Neo-Queen Serenity, in a final attempt to destroy Crystal Tokyo. 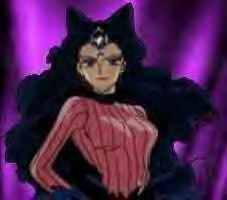 With Wicked Lady's anger and rage growing, she becomes a powerful ally against the Scouts.